Last week, the rain came down like mad. Since I try to take all my pictures outside, I haven't had a chance to take pictures of all the cool special projects that I've been doing. Soon, though, hopefully! 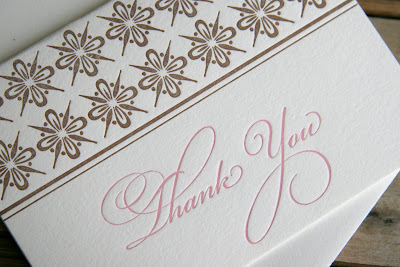 I am very excited to announce that you can now purchase Joie Studio custom letterpress samples through Google Checkout. Each package will have printed samples on at least three different papers and at least two different kinds of envelopes. The cost, with shipping included, is a mere $5, and you can use it as a credit towards your custom order. I had a little "incident" yesterday while cleaning my press. I think I was really inhaling too many fumes or something, because while the press was running, my hand got caught in the press for a fraction of a second, enough to scrape up my hand and make it hurt. Luckily, the chase wasn't in or anything (that would have been super bad) and the damage was minor. Just to let you know, it feels like someone accidentally slammed a door on my fingers. Nothing's broken, and I iced it with a bag of frozen corn so it's not too swollen or anything. Luckily I just had my tetanus shot! But to all of you with motorized presses, watch your hands! Tis the season for pinks and reds! I'm participating in Poppytalk Handmade this month, and I thought I would share some new items I have been printing. And what's the Valentine season without a love card? 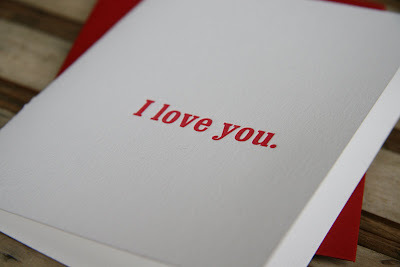 Plain and Simple: I Love You. All are available in my Etsy shop! Enjoy! My friend Carrie and I were talking today about the current trendy thing to do is to ride the "green" wave by using recycled papers and using soy inks in letterpress. This takes me back to when I was first setting up shop and I was trying to decide which inks to use on my press. Soy-based inks have such a lovely, environmentally-friendly sound to it. But if you look into it, the formulations aren't total soy formulations. Usually soy-based inks are about 20% soy, 80% everything you would normally find in regular rubber-based or oil-based ink. Soy-based inks use the same exact pigments as rubber-based or oil-based inks, and not many pigments are very environmentally friendly. Soy-based inks also dry in can from what I've read, so if a printer doesn't use their ink often, the ink will eventually dry in can, creating a top layer dry "skin" that needs to be disposed of to get to the good ink underneath. I ultimately decided on rubber-based ink because rubber-based inks don't dry in cans, creating less waste. In letterpress, you use just a little dab, hardly any ink at all, and so one of those one pound cans of ink will last YEARS. 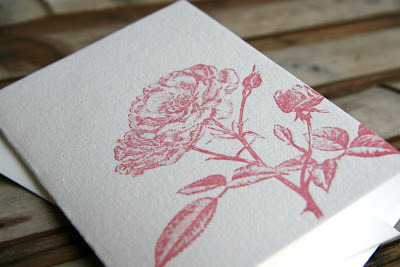 As for paper, Joie Studio does offer recycled cardstock and envelopes in addition to the 100% cotton stock that I use. My preference is for the cotton stock, but I do try to pair the stock with envelopes made from recycled paper whenever the design will allow. Clients need only ask for recycled stock on custom orders. More important to me is to limit my waste and spoilage by offering only papers that I know will print well. So while the printing here at Joie Studio isn't powered by wind energy and hasn't gone totally "green," you can rest assured that my choices have minimizing waste as a top priority, which is, to the very least, eco-minded. We designed a rad calling card to go with it, and I can't wait to print it!